The Statistical Techniques for Data Analysis contains, Meaning and Definition of Statistics Measurement and Enumeration Statistical Frequency Distributions Measures of Central Tendency Measures of Variability Deciles, Percentiles, Percentile Ranks and Standard Scores Normal Curve Correlation Regression Statistical Inference and Significance of Statistics Difference Between Means and Other Statistics Chi-square Test Non-Parametric Tests Special Methods of Correlation ANOVA Analysis of Variance and Factorial Designs ANCOVA Partial and Multiple Correlations Scaling of Tests Item Analysis Reliability and Validity Factor Analysis Use of Computer in Educational Research. 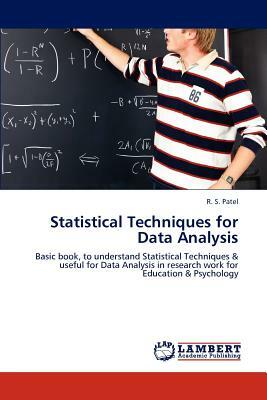 The book provide the clear understanding of basic descriptive and inferential statistics. It shows the practical understanding of statistics, in data analysis. It contains enough suitable illustrations for manual computation. This book will be useful for new researchers of M.Ed., M.Phil. and Ph.D., to choose the suitable techniques for data analysis.